If you follow a great number of blogs or news feeds you can collate the updates in one place by importing the RSS feed into Google Reader. Having the content in one place gives you many options such as scrolling through new updates quickly or searching for content that has already been written. Sign into Google and open Google Reader. 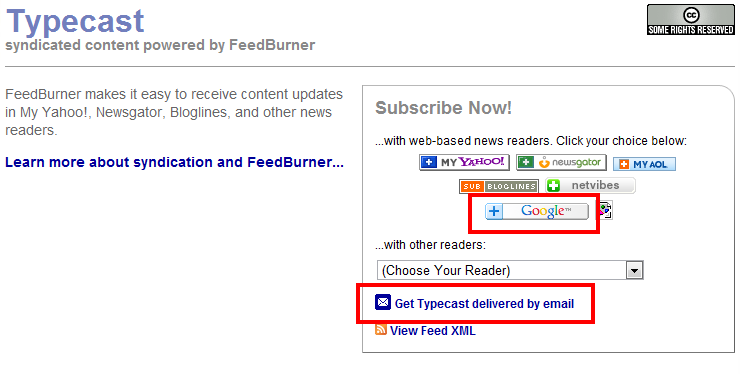 If you have a Google or Gmail account you already have access to Google Reader but if not, you can create a new account. Once you have signed in this is what your Google Reader will look like if it is your first visit. Visit your favourite blog and look for the RSS button.This is usually an square orange button with two curved lines and a dot but some bloggers display icons to fit in with their theme. Click on the RSS button and you will be redirected to a page that looks like the image below. Select the "Google" option (you can also opt to get new content delivered by email here). 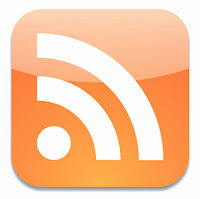 The blog RSS feed will be imported into your Google Reader. If you cannot find the RSS button on a blog hit the red SUBSCRIBE button in the top left hand corner and enter the blog address (URL). Google Reader will search for a feed within that URL and offer you the option to add that feed to your list if it finds one. 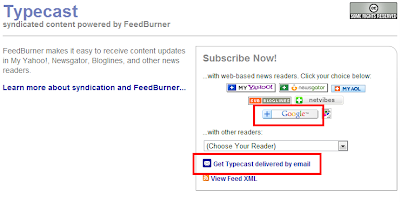 Repeat for each blog you would like to receive updates for. Your imported feeds are listed down the left hand side of the screen. The number of unread items for each feed will be displayed in brackets next to the feed title. Adjust your feed settings to suit you. It is your reading experience. Use the drop down menu on each individual blog feed to organise into folders for easy reference. At the end of each feed item are bookmarking and sharing tools. Use them to recommend a post. If you give an item a Google +1 recommendation using the share tools (or anywhere else on the internet) it will appear on your Google profile under the +1s header (as an example you can see my +1s here). You can sign into Google Reader from your phone or mobile device if you have the capabilities and it will sync your reading activity if you access Google Reader from more than one device. And please Please PLEASE PLEASE, if you are a blogger, activate your RSS feed, find out the link address and display your RSS feed button prominantly. You can also read my "How to subscribe to blogs" post for more info, hints and tips.